We feel extremely fortunate own Sierra Dawn Uno’s Monarch. This wonderful 30 inch tall stallion has repeatedly proven desirability in the national show arena and is now showing his prowess as a herd sire. We searched for ten years before we found what we believe is the perfect miniature Arabian cross for our Orion Mystic daughters. “Monarch”, put simply, has staying power. By this we mean that he was an exceptional individual as a juvenile horse and continues to be exceptional as an adult. This is indisputably verified by his show record. Monarch was an AMHA National Yearling Futurity Champion. The same year under a different group of judges at the same show he was crowned AMHA National Champion Yearling Stallion. 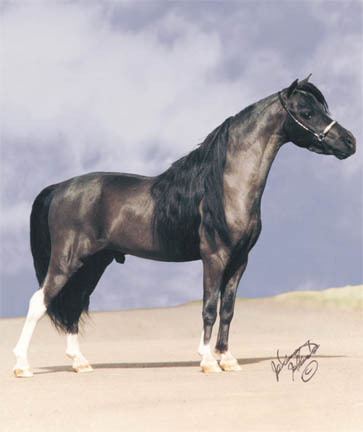 He came back as an adult and was an AMHA National Champion Senior Stallion. He was elegant and correct as a junior horse and continues to be an exceptional individual as an adult typifying the Arabian in miniature. Every year his offspring has won top ten Get of Sire. This is “Staying Power”. There are very few individuals within this breed that can boast such an outstanding show record or the fact that they maintain their proportionality and slender figure as they mature into an adult. Truly an Arabian horse in miniature!! As an adult Monarch possesses those illusive qualities that miniature horses often lose with maturity. He has a chiseled, dry head and face of an Arabian. His neck is naturally set high with a graceful arch. His throat area is naturally long and refined. His natural proportion gives him the look of a standard sized Arabian horse. Monarch’s body has an uncommon tightness and beautiful lines. We are proud to say that the picture above is Monarch in “pasture shape” He shows natural elegance without conditioning or other human intervention. This is important for us because the conformation of the horse should be the result of breeding and genetics, not artificial modifications. The result is genetic traits passed consistently to his offspring. The colts and fillies show these natural “born in” qualities that are so desirable. We prefer these qualities as a result of breeding and genetics, rather than being temporarily molded by the actions of human influences such as heavy conditioning, neck wrapping, or other means of artificial body sculpting. As a sire, Monarch is passing on his exceptional and unusual genetic qualities to his offspring. If you look at his offspring, you can see this uncommon elegance and Arabian look they all possess. We have found that breeding our daughters of Orion Mystic to Monarch give us very special individuals that are definitely on the forefront of the miniature horse industry. Monarch was the 2nd leading money winning AMHA Futurity sire in 2003 and 2005 and the 4th in 2004. With only three years of offspring, Monarch has been recognized on the AMHA top ten lifetime sire’s list every year. We expect more top awards each year. He is continually siring champions and top tens. He is building a world wide reputation for siring horses that receive world champion recognition when shown. On the local scene his sons and daughters continue to win grands and supremes. We feel Uno’s Monarch is one of the most influential sires of the 21st century. Names like Monarch Silverado, Monarch Aplozz, Monarch Mystique, Monarch Sterling, Monarch Chrome Passion, Monarch Mocha, Monarch Obsession, Reigning Monarch, Monarch Ovation, Monarch Coquette and Monarch Mariposa are heard in the winner’s circle frequently.